Noori has signed up with Walls as their brand ambassadors for the year 2010 and this merger is celebrated by a brand new song JHOOM LAY accompanied by a video! “Jhoom Lay” has been composed by NOORI in collaboration with noted music director Shuja Haider. The lyrics have been penned by Mr. Irfan Khan who is the Executive Creative Director for Lowe and Rauf. With this song, NOORI makes a comeback to the mainstream after few great performances in the second season of COKE STUDIO. Jhoom Lay video, which is shot in Bangkok by Ahsan Rahim, is easily NOORI’s biggest to date. The plot of the video revolves around two brothers who are portraying the two flavours of Walls Cornetto. Ali Hamza gets the spotlight this time around. Contrary to his image, he is portrayed as the fun loving, ‘milk chocolate’ character whereas the Ali Noor, who is usually the face of the band, gets to portray a mature ‘dark chocolate’ character. To download the song JHOOM LAY (Cornetto Song) by NOORI, 'RIGHT CLICK' and 'SAVE TARGET AS' on the link given below. 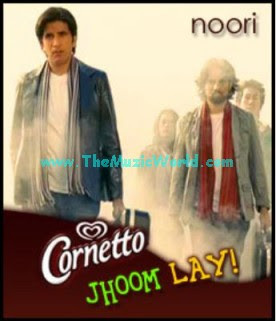 To listen the song JHOOM LAY (Cornetto Song) by NOORI, click on the blue PLAY button.